Damascus (Agenzia Fides) - The Syrian population lives in an undetermined condition, without "peace or war". An uncertain and difficult situation, which is becoming unsustainable for the weakest, and which sees an impressive decline in Christians, decreased in some areas by 77 percent compared to the times before the conflict. It is a picture full of gloomy colors that emerges from the brief and intense message for Lent released by Samir Nassar, Maronite Bishop of Damascus. "The reconstruction – points out the text, sent to Agenzia Fides - is frozen until further notice", while the dollar continues to increase its value compared to the local currency and the entire national economy is penalized by international sanctions that mainly affect the poorest people. In the worrying scenario described by Bishop Shamir Nassar, the "little flock" of Syrian Christians appears to be made even more fragile by alarming processes of aging and emigration: "In the last great meeting of families", says Bishop Nassar, reporting a very eloquent data, experienced in the context of his pastoral work, "only four couples were less than 50 years old. The aging of Christian families is an alarming sign". 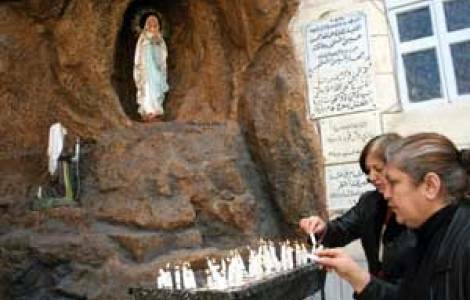 According to the first surveys - the Maronite Bishop says - Christians in Syria assume the appearance of "a minority that grows old, in the face of uncertainty": in percentage terms, they lost 50 to 77% of their members in the various regions compared to the times before the conflict. "If in 2009 they represented 4.7% of the population, how many are they today? What is the future of the little flock?"